Dry ice to chill down the grapes as they go into the tank, for a cold soak before fermentation. It’s often the case that our top red sells out just as it enters the peak period for drinking; we recommend getting some in for Christmas, of course, before it’s all gone. We think it’s better decanted for an hour but everyone enjoyed it a wedding recently, and that was from the bottle. 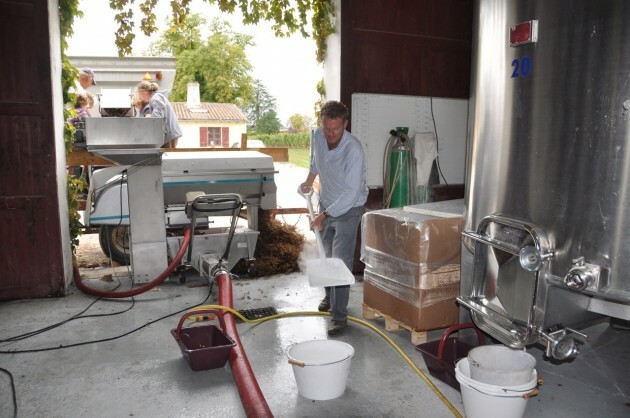 Here we are picking and making our 2011 – it seems like only yesterday but some of us look quite a lot younger in the photos. The wine itself has definitely aged better. We’re down to our last two pallets now and the wine is available for UK delivery here. Existing Bauduc customers should use their unique loyalty code (surname+initial, no space) for 10% off. New customers can also get 10% off using the temporary offer code Club2015, at the very end of the checkout. A case of 12 will therefore cost you £153, including delivery, equivalent to £12.75 a bottle. With this gallery below, scroll over or touch a picture for a description; click for a larger image then scroll using < and > on the screen. Tap X top left to return. We enjoyed a week at the Farmhouse in September-superb. The wine was not bad either !